1. Pipe a line on the "right hemisphere" away from your body, swooping around the edge of the cupcake, making an open smiley face. 2. Squeeze a swirl in the middle of the smile like a snake, making sure that the sides do not overlap, but snug next to each other. This may take a few tries! But no worries, your friends and family will love them because you put in the effort!! Send us pictures of your ghoulish creations! 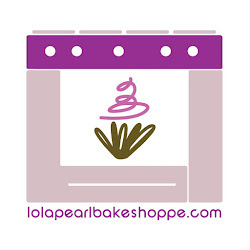 askLP@lolapearlbakeshoppe.com!